With mint flourishing in the garden, and produce bins groaning under the weight of the season’s juicy watermelon, this summer cooler has become my latest favorite drink. Remove pulp by pouring and pressing through a sieve. 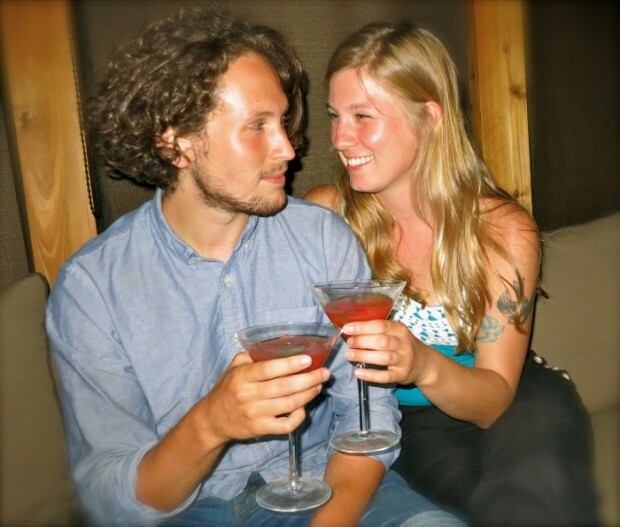 My son, Zan, and his girlfriend, Lucy, came to dinner, and I served these drinks with the appetizer. It’s intimidating serving Lucy a cocktail. Fresh from attending the Manhattan Cocktail Classic convention, she explored the hottest boites and studied the latest bar-tending tricks in the city. Her resume includes bar tending at Zingerman’s Roadhouse and Detroit’s Sugar House. 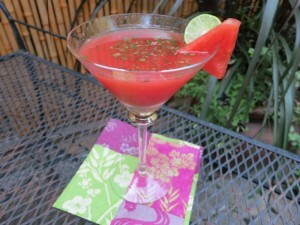 This recipe is an off-shoot of Watermelon Agua Frescas, a non-alcoholic cooler I made last year. 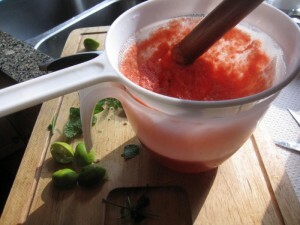 Wake up to a Watermelon Agua Frescas, then end your day with a Watermelon Mojito; could a summer day be sweeter? Make a simple syrup by dissolving sugar in 1 1/4 cup hot water. Stir until the sugar has completely incorporated into the water. Refrigerate until cold. In a blender or food processor, working in batches if necessary, combine 1 cup simple syrup with watermelon, 3 tablespoons lime juice and blend until smooth. Prior to serving, stir in chopped mint*. Serve with crushed ice, ice cubes, or strained into martini glasses (pictured) Garnish glasses with watermelon chunk and lime, if desired. * Mint may also be lightly muddled in a shaker to extract oils. Muddle, add drink, shake with ice then strain into glasses. Number of servings (yield): 4 cups, without the addition of ice or rum. More Recipes Filed Under "Cocktails"